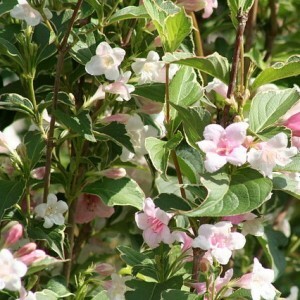 Weigela is a sort of rather decorative bushes. The plant belongs to the family of Caprifoliaceae and has received the name in honor of the famous professor Vaygel. This beautiful bush has bright green, with a white border, or the purple leaves. Fragrant flowers (in the form of small tubular hand bells to 5 cm, single or collected in magnificent inflorescences) can be white, beige, yellow, pink or red, coloring with various shades, changing throughout blossoming which is observed twice a year – in the spring and in August or in September.